Also serving communities of Hot Springs Village, Hot Springs National Park, Pearcy, Malvern, Arkadelphia. There are 6 Assisted Living Facilities in the Hot Springs area, with 5 in Hot Springs and 1 nearby. The average cost of assisted living in Hot Springs is $3,337 per month. This is lower than the national median of $3,346. To help you with your search, browse the 28 reviews below for assisted living facilities in Hot Springs. On average, consumers rate assisted living in Hot Springs 4.2 out of 5 stars. Caring.com has helped thousands of families find high-quality senior care. To speak with one of our Family Advisors about assisted living options and costs in Hot Springs, call (855) 863-8283. Named for the natural hot springs that have made this town famous, Hot Springs, Arkansas draws visitors and residents alike to natural mineral baths, views of the majestic Ouachita Mountains, antique shopping ,museums and more. Hot Springs is also home to five assisted living facilities and there is one other in the surrounding area. Assisted living facilities (ALFs) in Arkansas are defined by those communities which provide services that aid residents in activities of daily living. ALFs in Arkansas are classified as either a level I or level II facilities and are governed by The Arkansas Department of Human Services, Division of Medical Services, Office of Long Term Care. The cost of living in Hot Springs is 13.30 percent lower than the U.S. average, making it a viable choice for seniors on a budget. In the city of Hot Springs, property crime is very high with a score of 86.8 out 100. Violent crime is significantly less at 59.4 but is still more than twenty points higher than U. S. average. Hot Springs, Arkansas lies in the county of Garland. Lots of greenery and open spaces have earned this county's air quality an A ranking from the American Lung Association. This is noteworthy for seniors with respiratory illness who can breathe easier here. The weather in Hot Springs has an average comfort level with highs of 93 degrees, lows of 30 degrees and only three inches of snow per year. The lack of extreme temperatures can help seniors maintain an active life all year round. The Hot Springs area is home to world-class medical facilities, including CHI St. Vincent, National Park Medical Center and the Advance Care Hospital, in the event of medical emergencies or illness. Hot Springs has an array of community resources for seniors, including the CHI St. Vincent Hot Springs Senior Center, an organization that provides seniors ages 60 and older a free place to hang out, get nutritious meals and have fun as well as four other senior centers. Assisted Living costs in Hot Springs start around $3,337 per month on average, while the nationwide average cost of assisted living is $4,000 per month, according to the latest figures from Genworth’s Cost of Care Survey. It’s important to note that assisted living rates in Hot Springs and the surrounding suburbs can vary widely based on factors such as location, the level of care needed, apartment size and the types of amenities offered at each community. While Arkansas does not have any financial assistance programs aside from Medicaid, there are several different options seniors can choose from when seeking aid. 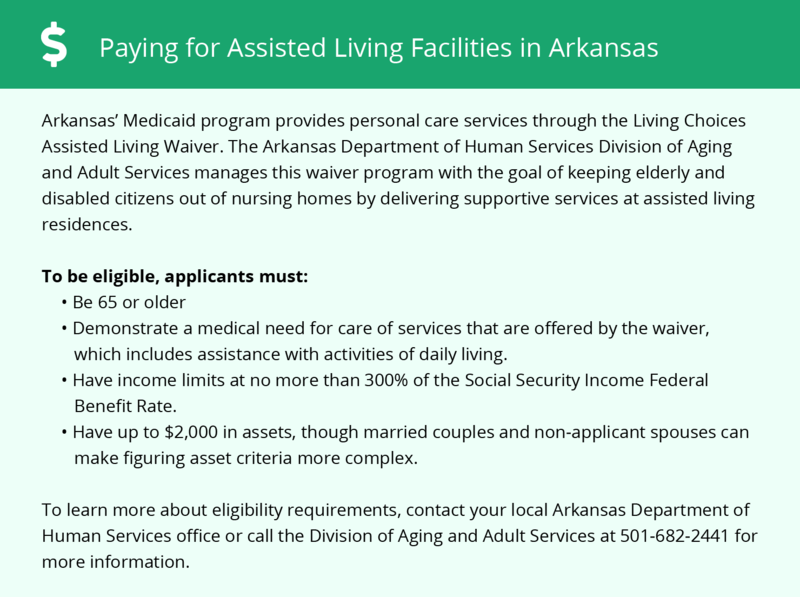 Medicaid in Arkansas covers the cost of living in an assisted living facility and has a variety of programs for individuals in assisted living. 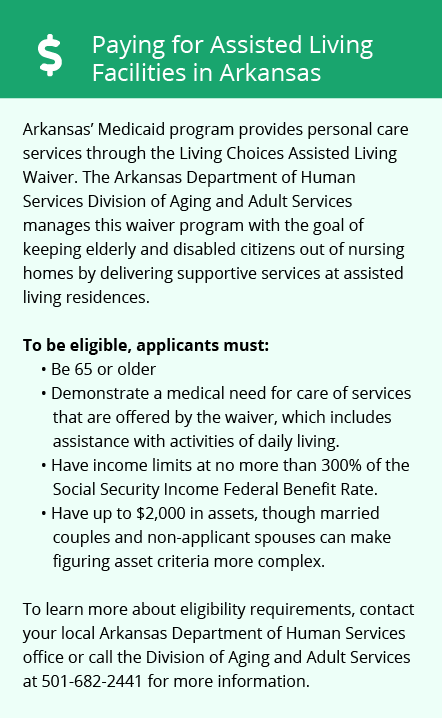 Arkansas Medicaid covers eligible seniors who need help with Activities of Daily Living (ADLs) through the Personal Care Program in addition to two waiver programs: the DAAS ElderChoices Waiver and the Living Choices Assisted Living Waiver. Hot Springs and the surrounding area are home to numerous government agencies and non-profit organizations offering help for seniors searching for or currently residing in an assisted living community. These organizations can also provide assistance in a number of other eldercare services such as geriatric care management, elder law advice, estate planning, finding home care and health and wellness programs. To see a list of free assisted living resources in Hot Springs, please visit our Assisted Living in Arkansas page. Hot Springs-area assisted living communities must adhere to the comprehensive set of state laws and regulations that all assisted living communities in Arkansas are required to follow. Visit our Assisted Living in Arkansas page for more information about these laws.